A generalization of the original peridynamic framework for solid mechanics is proposed. This generalization permits the response of a material at a point to depend collectively on the deformation of all bonds connected to the point. This extends the types of material response that can be reproduced by peridynamic theory to include an explicit dependence on such collectively determined quantities as volume change or shear angle. To accomplish this generalization, a mathematical object called a deformation state is defined, a function that maps any bond onto its image under the deformation. A similar object called a force state is defined, which contains the forces within bonds of all lengths and orientation. The relation between the deformation state and force state is the constitutive model for the material. In addition to providing a more general capability for reproducing material response, the new framework provides a means to incorporate a constitutive model from the conventional theory of solid mechanics directly into a peridynamic model. 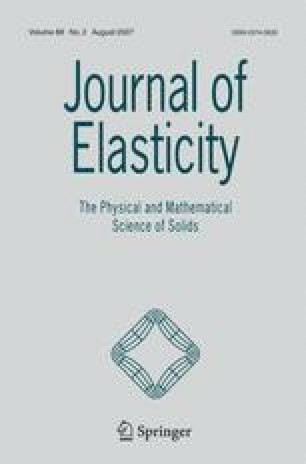 It also allows the condition of plastic incompressibility to be enforced in a peridynamic material model for permanent deformation analogous to conventional plasticity theory.